Nonagenariansare a growing population often viewed as high-risk surgical candidates. 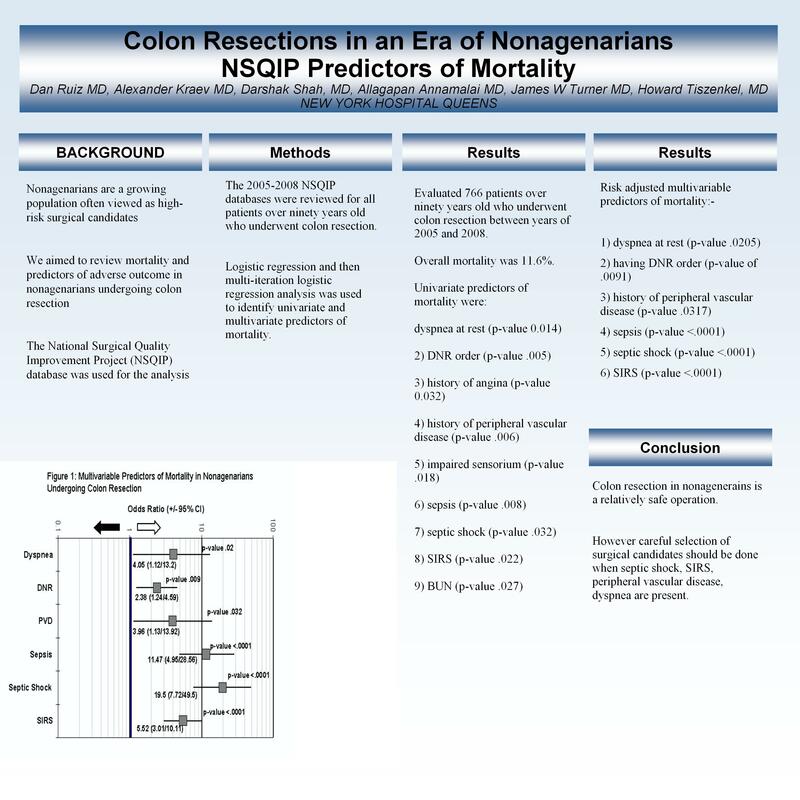 This study aims to review mortality and predictors of adverse outcome in nonagenarians undergoing colon resection.The National Surgical Quality Improvement Project (NSQIP) database was used for the analysis. The 2005-2008 NSQIP databases were reviewed for all patients over ninety years old who underwent colon resection. Logistic regression and then multi-iteration logistic regression analysis was used to identify univariate and multivariate predictors of mortality. The study evaluated 766 patients over ninety years old who underwent colon resection between years of 2005 and 2008. Overall mortality was 11.6%. Significant univariate predictors of mortality were: dyspnea at rest (p-value 0.014), having DNR order (p-value .005), history of angina (p-value 0.032), history of peripheral vascular disease (p-value .006), impaired sensorium (p-value .018), sepsis (p-value .008), septic shock (p-value .032), SIRS (p-value .022), and BUN (p-value .027). Risk adjusted multivariable predictors of mortality were dyspnea at rest (p-value .0205), having DNR order (p-value of .0091), history of peripheral vascular disease (p-value .0317), sepsis (p-value <.0001), septic shock (p-value <.0001), SIRS (p-value <.0001). Colon resection in nonagenerains is a relatively safe operation.However careful selection of surgical candidates should be done when septic shock, SIRS, periphearal vascular disease, dyspnea are present.